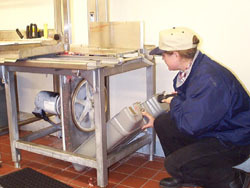 The Maine Meat and Poultry Inspection (MMPI) program exists to protect the health and welfare of consumers by ensuring that livestock used in the production of meat and poultry products are humanely handled, disease-free, and that the resulting products distributed by Maine inspected establishments are wholesome, not adulterated, and correctly labeled and packaged. The program, under a Cooperative Agreement with the USDA Food Safety Inspection Service (FSIS), must implement inspection activities that are at least equal to that of the inspection activities of FSIS. MMPI started daily inspections on June 16, 2003. The objective of the Meat and Poultry Inspection program is to assist Maine's very small to medium sized livestock and poultry producers, by providing an avenue for their product to enter state commerce. This, coupled with timely, local decision-making will build on the success of the current industry while promoting additional business within the state. If you are interested in state inspection, or have any questions regarding the information presented on this website, please call: (207) 287-3841. Poultry Exemption - Commonly known as the "Fewer than 1,000 bird exemption"
You will be contacted by a field inspector in your area, who will help you plan a poultry processing area on your farm that meets your needs. Poultry Exemption - Commonly known as the "Grower Producer Fewer than 20,000 bird exemption"
The intent of the fewer than 20,000 bird exemption is to provide a means for a small grower to process whole and cut up birds on the farm for local distribution. This exemption allows the grower to process birds in a commercially licensed facility without being under inspection each time birds are slaughtered and/or processed. It is the goal of Quality Assurance and Regulations to help the producer understand and implement good food safety and sanitation practices. Read the information in these documents provided below if you are raising fewer than 20,000 birds/year (even if you raise less than 1,000 birds), AND you want to sell the product retail and wholesale within the State as whole, halves, quarters, parts, ground, pies and other types of poultry products. Poultry Exemption commonly known as the "Small Enterprise Fewer than 20,000 bird exemption"
The intent of the small enterprise exemption is to provide a means for a small poultry slaughter/process facility to raise birds, purchase live birds or dressed poultry in a combination that number fewer than 20,000 birds to be slaughtered and processed for local distribution in the form of whole or cut up birds. This exemption allows for the processing of birds in a commercially licensed facility without being under inspection each time birds are slaughtered and/or processed. It is the goal of Quality Assurance and Regulations to help the producer understand and implement good food safety and sanitation practices. Read the information in these documents provided below if you are raising fewer than 20,000 birds/year (even if you raise fewer than 1,000 birds) AND you want to sell the product retail and wholesale within the State as whole, halves, quarters and parts (no ground, pies and other types of poultry products). Read the information in these documents provided below if you are raising rabbits for meat with the intention to sell the product, or you are processing rabbits for someone who intends to sell the product. Includes product like whole, halves, quarters, parts, pies, ground and other types of products. As a Cooperative Partner with USDA, FSIS, the Maine Department of Agriculture, Conservation and Forestry, is committed to fair and equal treatment of all of its customers. The Maine Department of Agriculture, Conservation and Forestry and the Maine Red Meat and Poultry Inspection Program is an equal opportunity provider and employer. Read the USDA Non-Discrimination Statement. MMPI headquarter offices provide reasonable accommodation and accessibility for people with disabilities. Please contact the state ADA coordinator at (207) 623-7950 or by email at eric.dibner@maine.gov for more information. The State of Maine Relay for the Hearing Impaired can be accessed at http://www.maine.gov/rehab/dod/resource_guide/tel_relay.shtml. Requests for interpreter services for any of the documents on this webpage can be made by calling the Division of Quality Assurance and Regulations (QA&R), (207) 287-3841. QA&R will set up a 3rd party call between the interpreter, LEP person and QA&R-MMPI personnel, for review and discussion of any critical information. In addition, an "I Speak" poster is displayed in the reception area of the Department of Agriculture, Conservation & Forestry - Division of Quality Assurance & Regulations-Maine Meat and Poultry Inspection (DACF-QAR-MMPI) and in each of the Maine Meat and Poultry Inspection establishments, where recipients of and applicants for inspection services may visit. For your information, our Limited English Proficiency Plan and the "I Speak" poster can be reviewed in the following links.